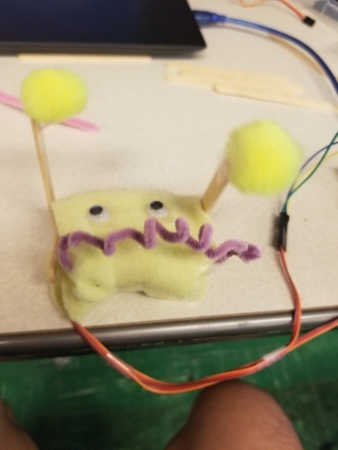 This week we continued our exploration of Arduino with the focus of creating Pom Bots, which utilize Servos that can rotate 180 degrees. I had done three different bots, with the last one being the final bot. My first design prototype was the PenguinBot. However, due to lack of the specific colors of material I needed, it ended up looking more like a duck. This used one Servo and didn’t move. Instead, it shuffles (or waddles). 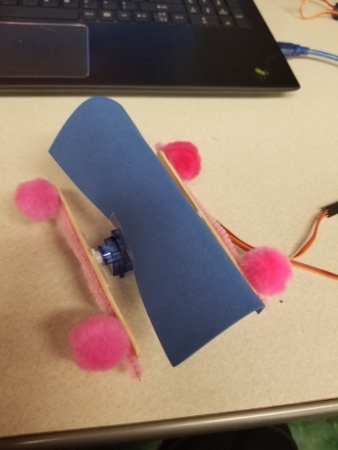 My second prototype was a RacecarBot. I used fluff balls as wheels and popsicles for the main structure. After tinkering with the Arduino code I still could not get it to move. However, I liked the sleek design. The third prototype was a grass hopper (BotHopper). However, it was very frustrating to get it to move. I shifted pieces around and changed limb sizes to try to find the ideal angles and lengths. After a while I discovered that if I turned it upside down it could move slightly. I considered this a success. It no longer looked like a grass hopper, so the initial redesign I devised was some sort of monster with pom pom hands. I wrapped a yellow felt around the two Servos and named it MonstaBot. It moves, a little. Overall the assignment was tough. 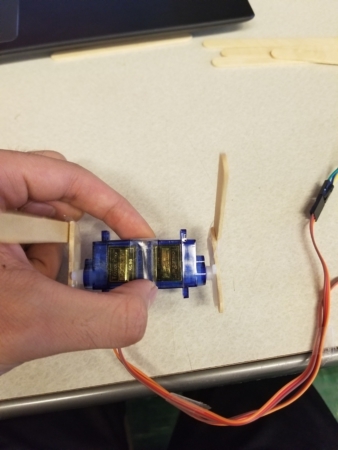 Linear movement was very conceptually difficult for me to understand (much harder than I thought) and it was a challenge to do that using the Servos, which cannot move in a full circle. If I were to redo this project I would probably try to find a better mechanism so that it moves more fluidly. 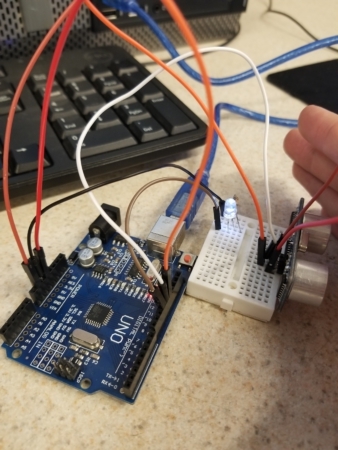 For this week we experimented with an Arduino UNO device. 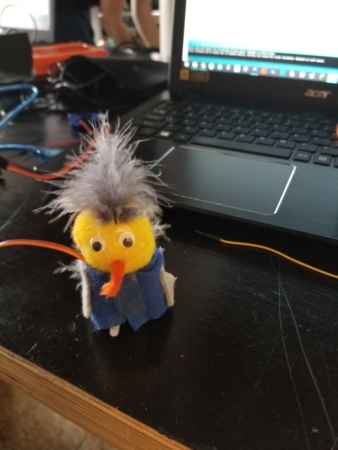 The first project was a very simple blinking LED. We modified the C code to create different blink patterns. I changed the code to blink my surname in Morse code, which I thought was pretty neat. We also created a touch sensor button using aluminum foil that could turn on the LED. To get further practice with the Arduino, I decided to create a simple LED alarm system. Whenever an object is close to the sensor it will light up the LED. To accomplish this I followed an online tutorial. It was fairly straightforward and I connected the components together. When I completed the wire connections, my device short-circuited. This was a difficulty I encountered that required me to find the cause. After a bit of debugging, it turns out my HC-SR04 (the distance sensor) was reversed in position which was shown the opposite orientation in the tutorial. Also, it turned out that my LED and resister were not hooked up together properly. After fixing this the device worked and would light up whenever you put your hand or another object in front of the sensor. Borrowing the code from the tutorial, I modified the distance to make the LED light up only when it was a little further away. I think this is more realistic if this were to actually be used as a component in an alarm system. Although I know how to code, I think the hardware part of this lab was more difficult for me. Before this week I have barely touched circuits and breadboards. I think it was a good learning experience. For the last couple of weeks we learned about sewing and embroidery. 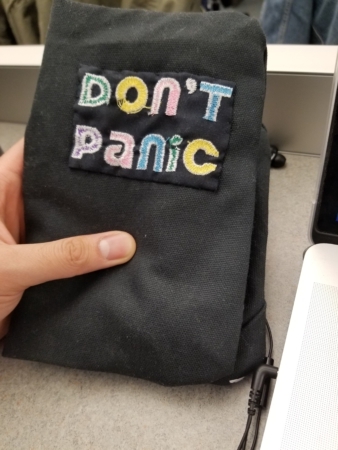 I created three things: a simple drawstring pouch, an embroidered multicolor patch, and a custom-sewn soft tablet case. I feel that sewing is pretty tough and requires careful precision. But with the help of my TA Emilie I think my pouch turned out nicely. 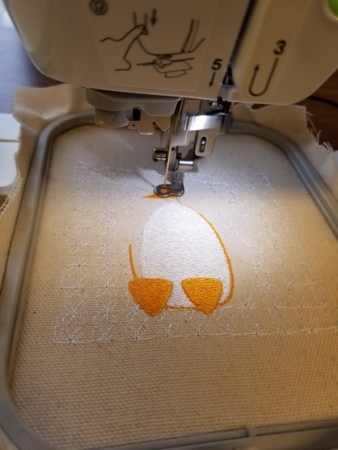 For the second assignment I used embroidery to create a patch. I chose a picture of a penguin because I like penguins. I chose a beige strip of cloth to create contrast from the white background design. 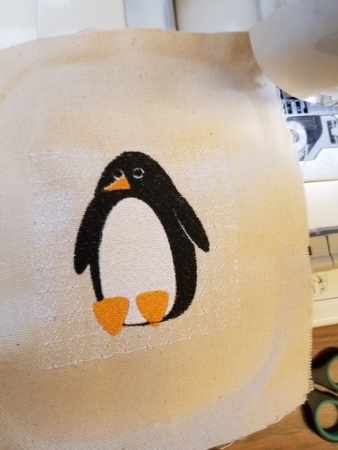 Although the penguin embroidering was dense, the background wasn’t as much and if I were to redo this I would make it denser. 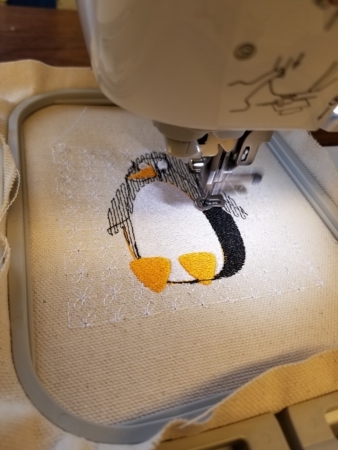 This overall process took a while since the stitching for the penguin was very dense. For the final project I decided to create a tablet case. This process was fairly tough and complicated, even with the step-by-step tutorial provided. I printed out the design templates on paper and cut them out. Then I chose a strip of vinyl and cut out the pieces of cloth with the sizes designated by the template. 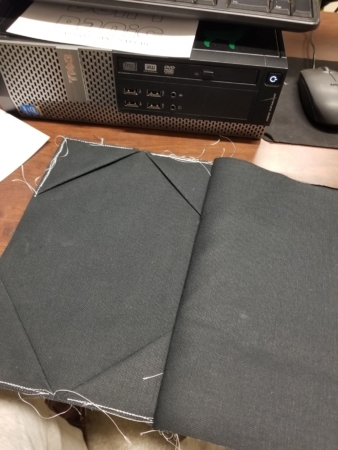 The first part involved folding four small rectangles as pockets, and sewing it onto one of the inner sides. Then this was basted onto the other inner side (which would be ripped out later). Next, a larger chunk of vinyl was sewn over this set. 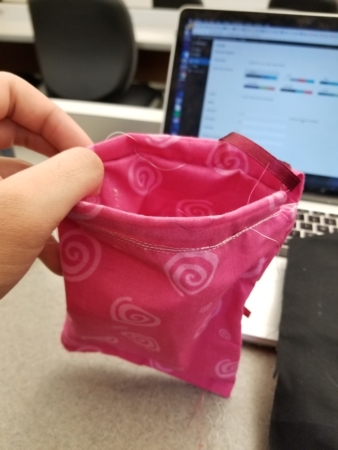 I was confused because this would mean that the entire thing is sewn shut but Duncan and Emilie explained that the basting stitch would be ripped out later using the seam ripper, and that it would be turned inside out. I then decided to embroider some text onto the tablet case. I chose black, since even though it was a different texture and slightly different color than the main case, I think it would blend in well. This process was fairly straightforward. My needle broke midway causing a small part of the ‘o’ to be missing, but Duncan helped me reattach the needle. 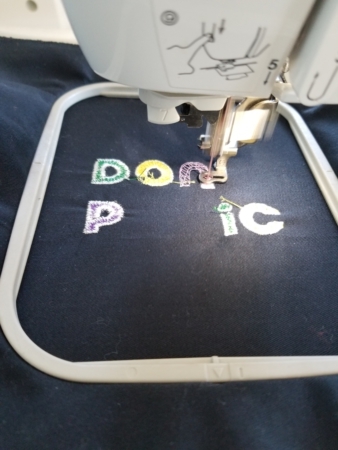 Also, the bobbin thread was really thick for a couple of the letters for some reason, but it wasn’t too big of an issue. The embroidered patch and the main tablet case were sewn together to produce a final product. 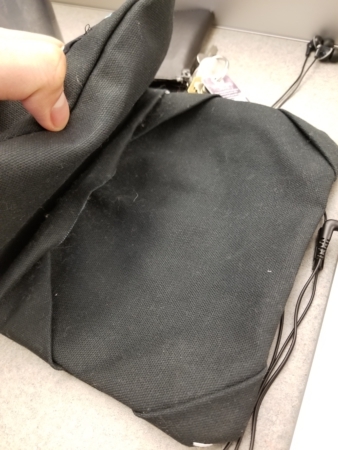 I also inserted some extra fabric to provide cushioning for the case. Overall the process was frustrating due to issues like machines not working and needing maintenance, as well as requiring some ability to decipher the instructions, but I think I learned a lot in the process. 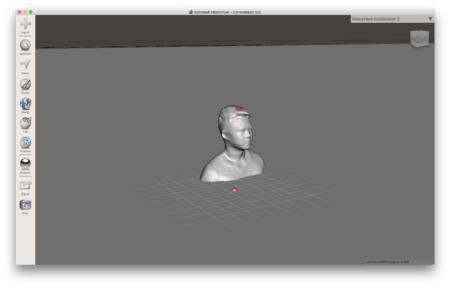 For this assignment we learned a bit of 3D modeling and the basics of 3D scanning and printing. We used various software such as Tinkercad and Meshmixer. There were other options like Fusion that appeared to be more advanced but I did not end up using them. As an introduction, I made a robot using Tinkercad built-ins and used Meshmixer to sculpt some of the parts. 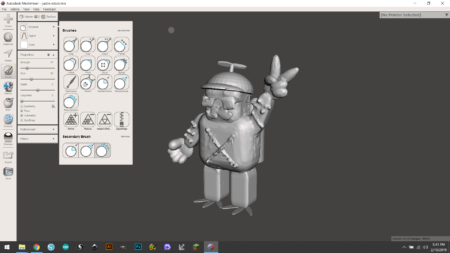 Although it was simple, I learned how to scale the size and position of objects, rotate them, create holes, and also use sculpting tools in Meshmixer such as smoothing. We also used 3D scanners, using two different tools. Here is the output of one of them. It was somewhat detailed, but the top of my hair was cut off so I used some of the smoothing tools to make it look more normal. For the final design, my original plan was to incorporate a model of myself (replacing the dog) into a painting (A Friend In Need by Cassius Marcellus Coolidge). 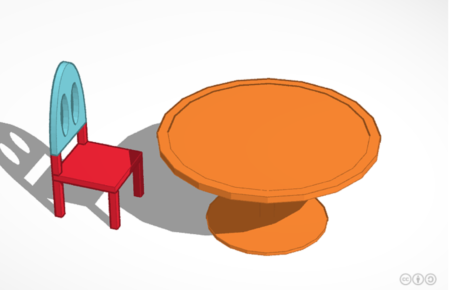 I initially designed a chair and the table using Tinkercad. But I realized that since I didn’t have a full body scan of myself I decided against it. I also felt that the background (e.g. the walls, the painting on the wall, and the ceiling light) was an important part of the painting and I wouldn’t be able to replicate those easily. I ended up choosing to design a custom set of dining utensils. My idea is to have a set of sideways-oriented utensils that makes it difficult to eat. I originally designed normal looking silverware and then rotated the positions of the non-handle end. The handles were created with ellipsoids, and the fork was created with several rectangular prisms and triangular prisms. The spoon was created with half of an ellipsoid, and then cutting a hole in it by creating a smaller one slightly above it. The knife edge was drawn. 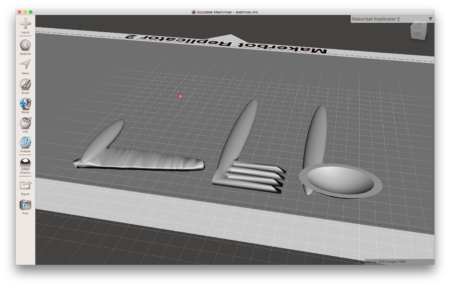 I exported the three pieces (the sideways spoon, fork, and knife) into Meshmixer. I did a bit of blending on the bottom sides of the pieces to make it look slightly less awkward. 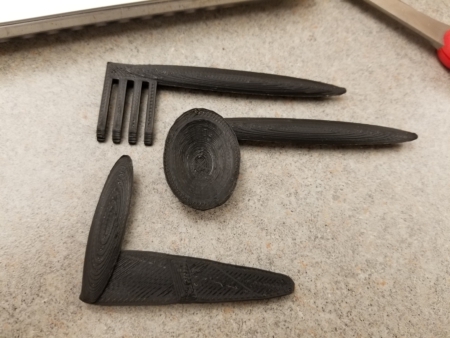 I went to the BIF makerlab to print my utensils but there was a three hour wait so I took a bus to the Urbana Free Library and did my prints there. After peeling off the supports this was my result. Although I have not tried it, I would personally choose to not eat my dinner with these. Overall I am satisfied with the result and have definitely learned a lot about 3D modeling in the process. 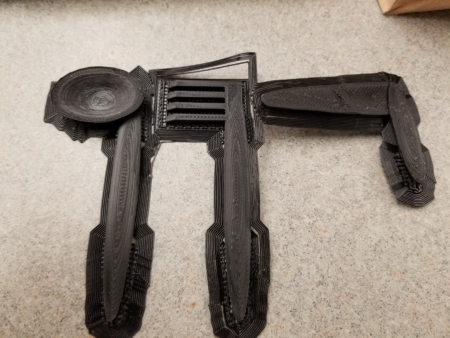 If I were to repeat the process I would probably print my utensils a little bigger and maybe add more structure to the connecting points to make sure it’s even sturdier (I did not break it when peeling off the supports but I was a little anxious about the possibility.). 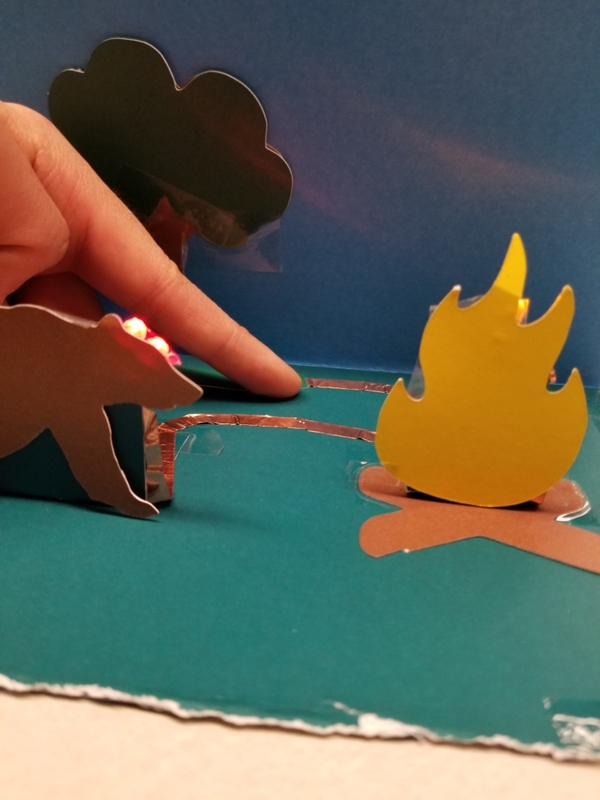 For this assignment we used LEDs in a copper tape circuit to create a project with colored lights. 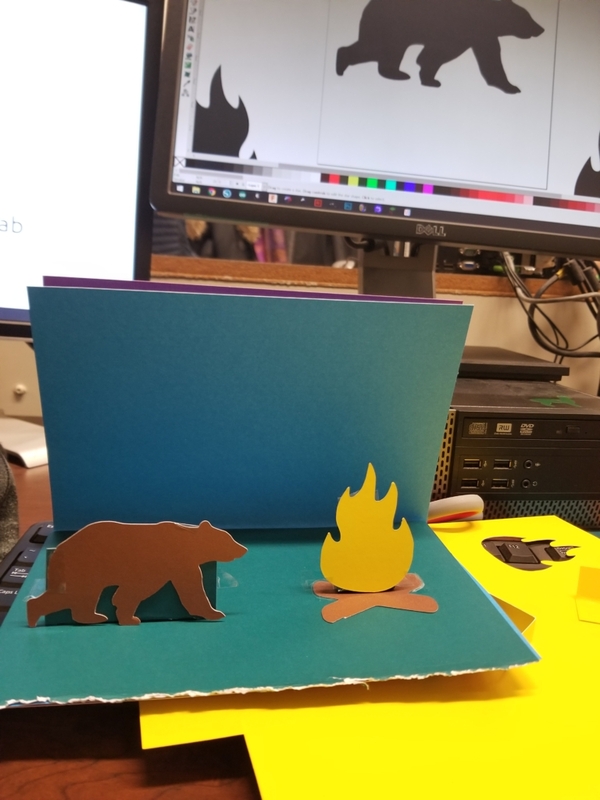 For my project I decided to design a bear with two glowing red eyes, next to a campfire. 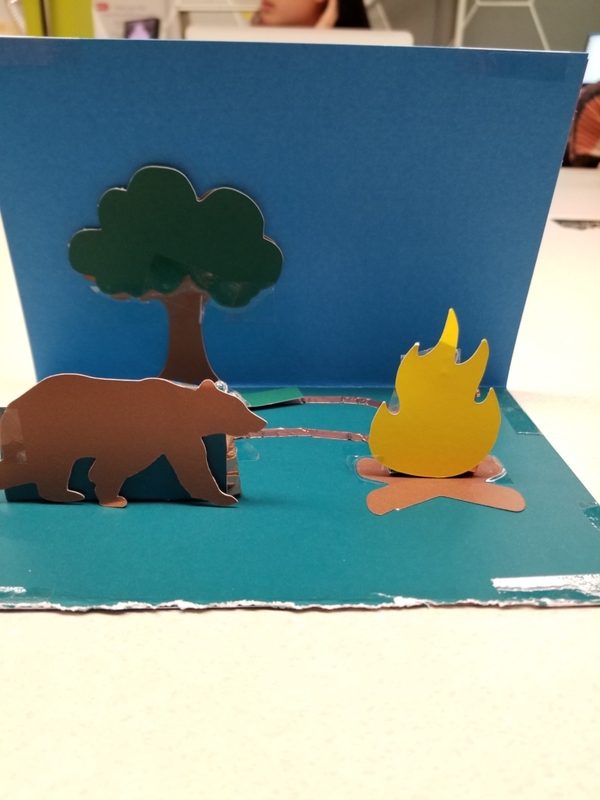 Two red LEDs would be placed behind the bear and a yellow LED would be placed behind the fire. 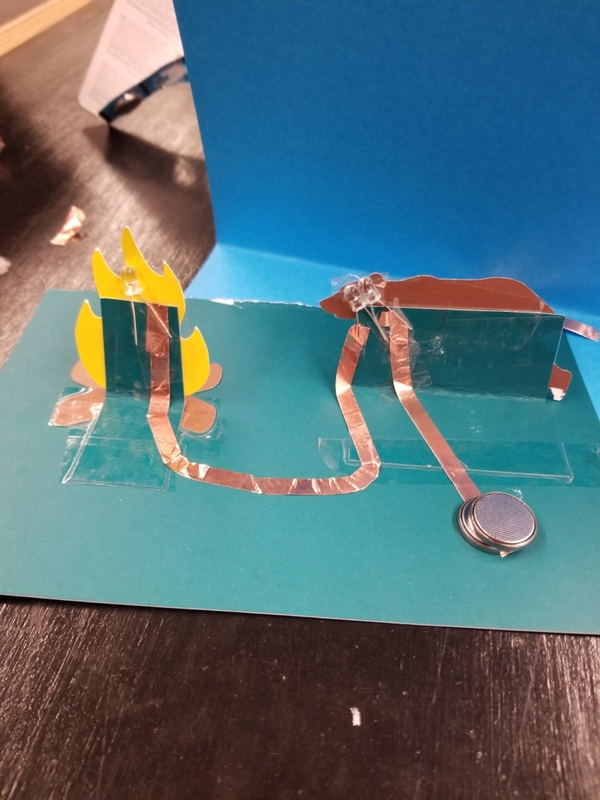 The circuit would be a series circuit with three LEDs, two batteries, and a switch. I chose series because it is simple and sufficient for the task. Although the voltage is shared between the LEDs in a series circuit, I did not need a parallel circuit because of the colors I used. I did not include a sketch because I did not draw one, but I had the layout planned in my head. I initially started to design my project. I cut out silhouettes with construction paper and cut them out with the sticker machines. I cut out some rectangles to balance the objects perpendicular to the ground. This is what it looks like before the circuit was added. I started to build the circuit. 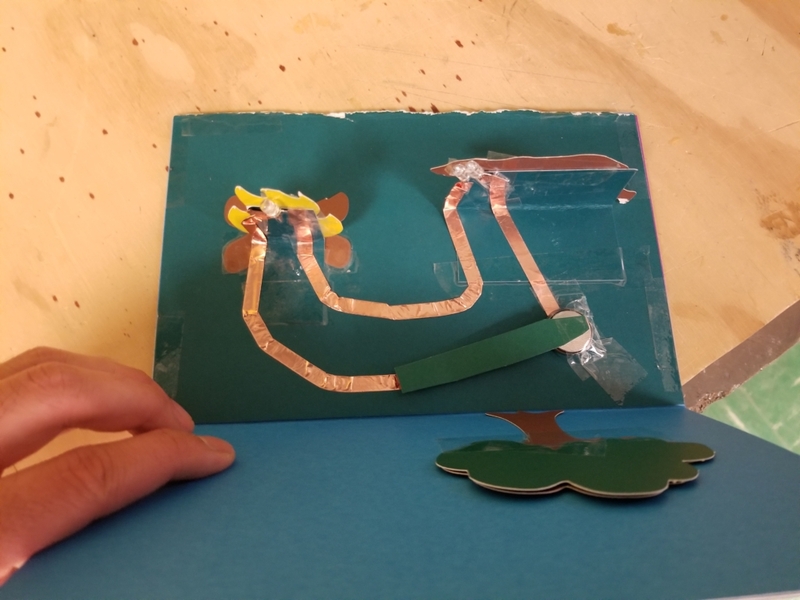 The circuit is able to light up using a switch. I also added a tree to decorate the empty sky. This is another view of the completed circuit. Overall I like my design and the LEDs light up appropriately when the switch is connected. However, one mistake I made was that my pop-up objects were too far from the background. Thus it only lights up well when it is dark, as it is a little dim when there are lights in the room or from natural sunlight. If the objects and LEDs were placed closer to the background, the objects would appear illuminated more. To learn about stickering, before the main assignment we worked on two simpler stickers to create. My first was a single-layer sticker which was a hybrid of a dog and a bird. 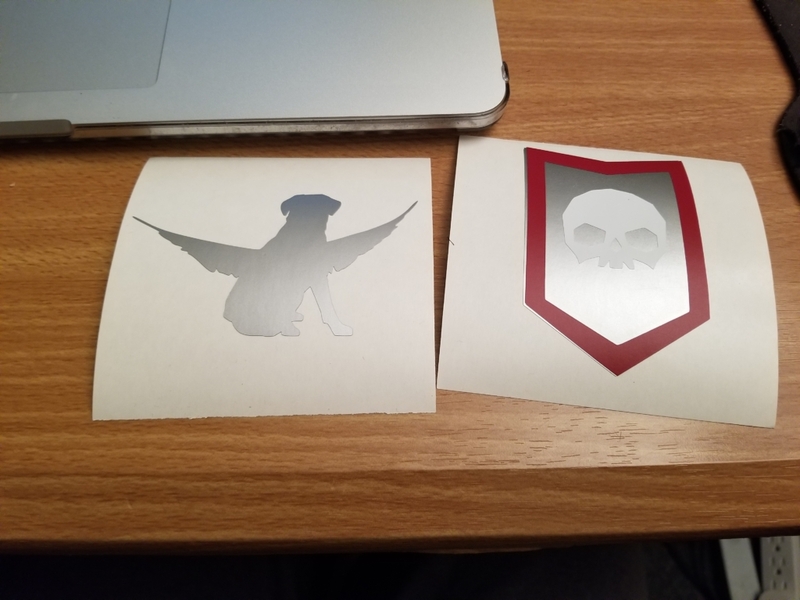 The second was a three-layer sticker of a shield. 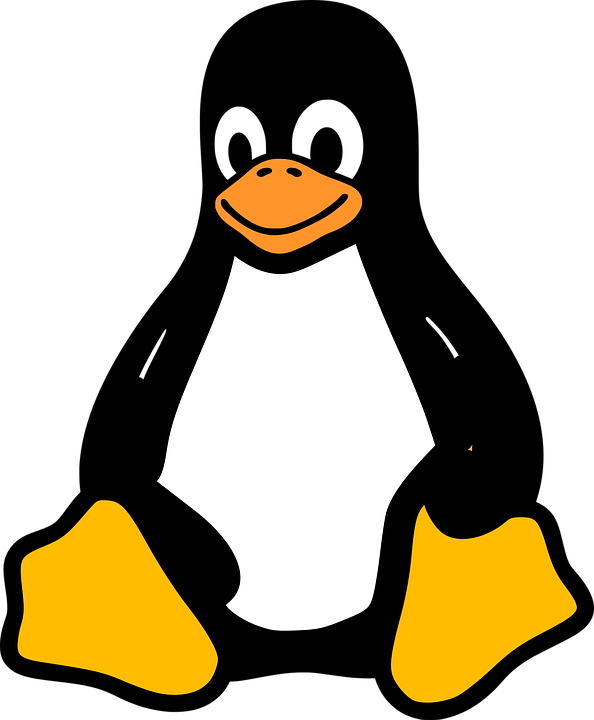 I decided to make my final multi-layered sticker of Tux, the Linux penguin. I thought the black could be used for the base layer, with the feet, stomach + eyes, and beak each their own layer on top. I realized the beak has small details for the nose and smile, which could be done by either sticking an extra black layer on top of the beak, or by cutting the holes from the beak. I decided to do the second option because I felt it would be more accurate. 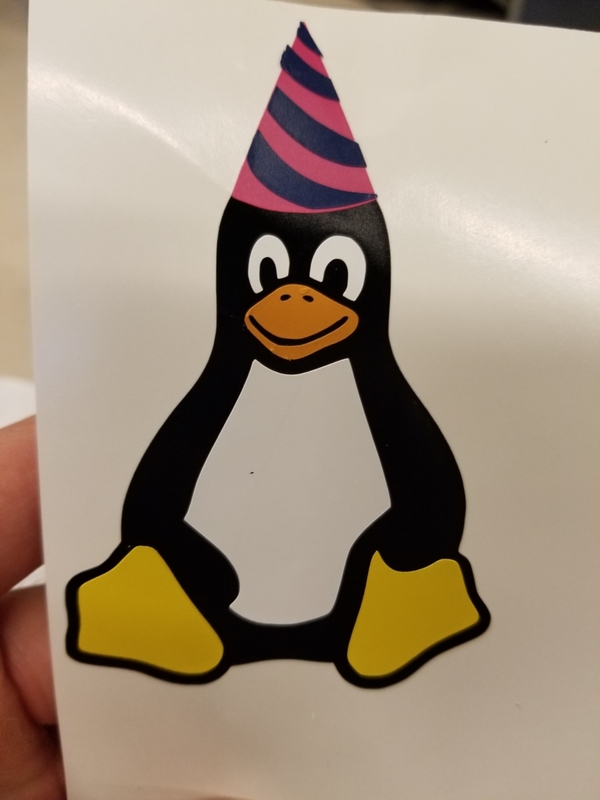 To customize the sticker I added a picture of a hat, which would be placed on top of the penguin’s head. After ungrouping the parts on Inkscape, I did a few more changes to properly join the feet and the white parts to be the same layer. Features like union, intersection, etc. 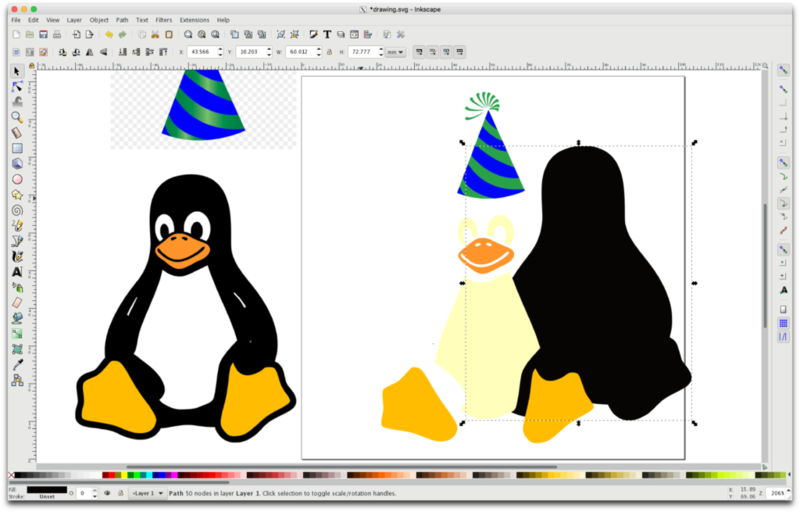 on Inkscape were very useful and made the process easy. My TA Emilie also advised me to extend the black base layer to be joined with the hat as otherwise it may look wonky which I did later. After I separated each part into their proper layers, I placed them back together and sent the picture to the silhouette program. Although I did not get a chance to take pictures of the sticker printing and physical layering process, I will describe the process. For the most part, the layering went smoothly. However, one issue I encountered was the printing machine printing from the wrong starting offset. 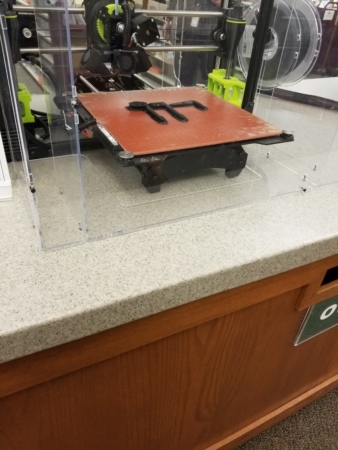 I thought this was the case because I was using the wrong plastic grid, but even after using the correct grid it was still printing more or less an inch to the right, which I had to account for for every print. Another minor issue was printing the hat. For some reason, the individual stripes of the hat would have trouble printing without getting removed from the sticker during the printing. I had to print this multiple times so I could use each stripe from multiple prints. The very top of the hat was even worse and could barely be printed. It was too thin and did not work very well so I omitted it from the final product. I think overall my sticker turned out fine. The placement was not super precise but I am fairly happy with the result. For our storyboarding assignment my group decided on an idea of a model skeleton that would have touch sensors attached to an interactive screen to help students learn the different bones in a human body. 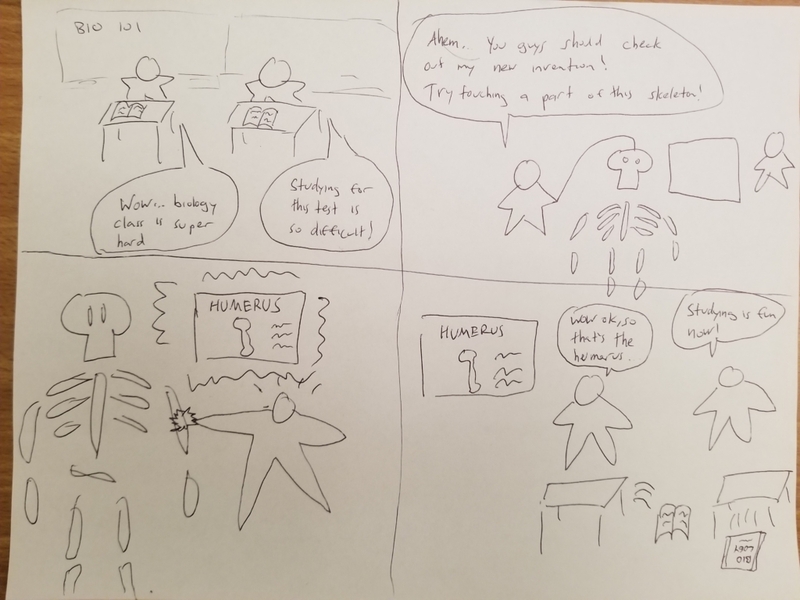 For my second version of my storyboard I added more detail to make the setting more obvious. For this assignment we designed a name tag that reflected our interests. I initially created a simple name tag in the shape of a rounded rectangle with just two elements: my name, and a silhouette of a penguin. This was printed on a thin strip of plywood and it printed quite well. For the second edition of the name tag, I decided to add some complexity to further explore Inkscape. I added another silhouette (of a guitar) to the left of my name, a text description saying my major, and a wavy line for added effect. Although it is difficult to see in this picture, to the left of the guitar silhouette is a small hole that was carved off and that can be used to put the name tag in a keychain, for example. 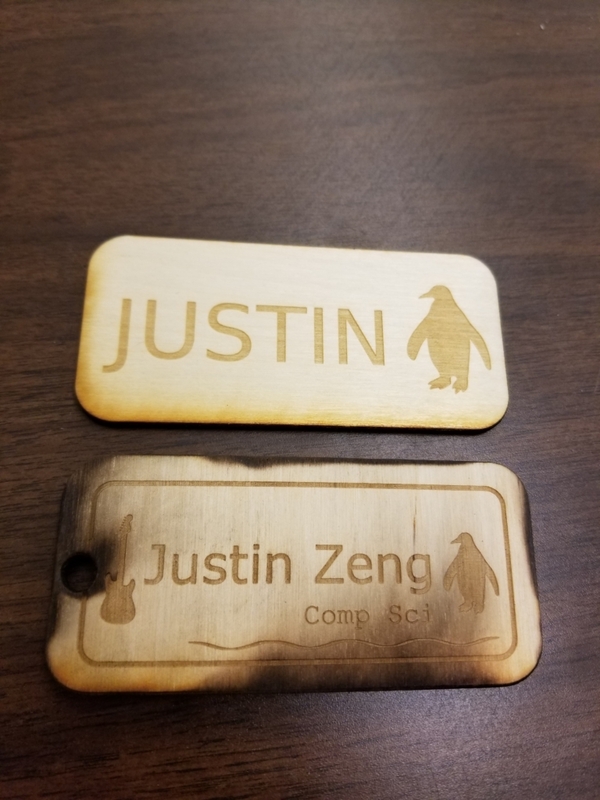 I decided to print my second name tag on a thicker board of plywood. Although this resulted in some visible burning of the name tag, I feel it was a suitable trade off. Having added thickness provides some extra durability and I wouldn’t have to worry as much about it snapping in two if I actually put it on a keychain or something. Although some of the charring makes some parts of the name tag less legible, it can easily be reprinted if one decided to forgo the sturdiness. Overall I think my project went quite well. I like the simple, fairly clean, and playful aesthetic of the name tag and also feel that it accurately reflects some of the things I like, like guitars and penguins. One challenge I encountered was to determine the placement and size of the carved out hole. If it is too big or close to the edge it may rip. I asked my TA Emilie and she helped me determine a good placement for it. Overall I feel that this project was enjoyable.